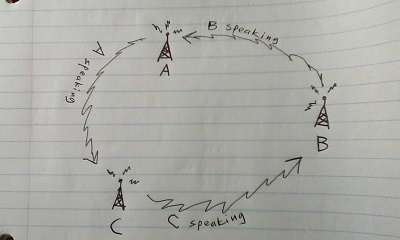 I wonder if it is possible to design a wspr qso mode that allows multiple stations to handle the communications, as in this sketch? 16:55Z - I am still on 80 meters wspr at the moment. Haven't heard any stations since 1546. My signal seems to have fizzled out around 1626 with station "KPH" giving me the last reports (and multiple reports on my signal at one time stamp? What is the deal with this station it often gives me multiple spots on my signal at one time, so bizarre. Am I just imagining it? Seriously, sometimes I wonder that I can't trust what my own eyes are showing me anymore). and nice wspr signals from distant places. We should go for a walk sometime, you and me. I... I feel a deeper connection somehow like... we see eye to eye. I'll show you some of the coves around here. and Perseus heard, on an eighty meter heard, the sounds of the maidens, the sorrowing sounds of a lonely girl's cry. And a silent boyfriend, good bye. And that is all they heard of the whispering worlds... the day they landed and took us all away. The day they... came for us. Whispered many meanings into our soft, pink, jelly minds. And that day, no man knows. Free beer tomorrow. Wait, this is ham radio. Good thing we are trained to be able to do this. Man the machines that look. The results will always belong to those who dreamed, and never shied away... from lifting their whispers to heaven. To you, our ancient ancestors, we bow. These great ones from whom we came. They know... understand... the value of a whispering wing. To you back there, millions upon millions of ages ago. We whisper back to you across the dust of time... and say..
13th 0156 I switched down to 80 meters now. I have gotten better at swapping out the two different loops, the solid tube version for 40-10 and then the double loop of hardline to get on 80 meters. I would really like to get something going on 80 meters that is close in. I miss the old days of 80 meter rag chews... it was so fun to listen to those guys talk onto the night. What a time that was.